Lion Air, an up and coming discount airline in Indonesia that’s banned along with a number of other Indonesian airlines from flying in the EU, just had a mishap in Bali which has brought attention to a deadly threat faced by every pilot: Wind shear from a sudden storm or squall. All 108 passengers and crew survived with only a few minor injuries when the Boeing 737 passenger jet undershot Bali’s main airport runway and belly-flopped in the water. It should be noted that both pilots have been cleared for drugs and alcohol while investigators are still poring over the flight data and the interactions between the pilots to determine whether the crash could have been prevented. One passenger also indicated there was no sign of trouble – until the aircraft suddenly dropped into the water. The new $89-million Boeing is now a total write-off but it could have been worst as wind shear was blamed on the crash of a Delta Air Lines Lockheed Tristar on approach to the Dallas airport in 1985 in an accident that killed 134 passengers and crew. The Boeing 737-800 is equipped with a “Predictive Windshear System” but it can still be a delicate balance for pilots because if the aircraft’s speed is too slow and you hit a downdraft, you sink while coming in too fast poses its own set of problems because in Bali, it would have meant hitting a road or more sea. It should be noted that we have occasionally talked about wind shear or downdrafts or wind in general, including a post which contains a few wind shear videos. The Associated Press has reported the results of an National Transportation Safety Board (NTSB) accident report which concluded that a pilot’s inability or reluctance to fly quickly enough out of icing condition led to the deaths of all five people aboard the aircraft (including the pilot’s wife and two children). The pilot of the single-engine Socata TBM 700 had more than 1,400 hours of flight time and had departed from the Teterboro Airport in New Jersey en route to Georgia when the aircraft spiraled out of control at 17,000 feet and crashed on a wooded highway median with wreckage scattered over half a mile – forcing a closure of the highway for several hours. We’ll let you know what happens when we get in there and if we could go straight through, it’s no problem for us. He was and within about a minute, the aircraft had reached 17,800 feet and then began an uncontrolled descent. 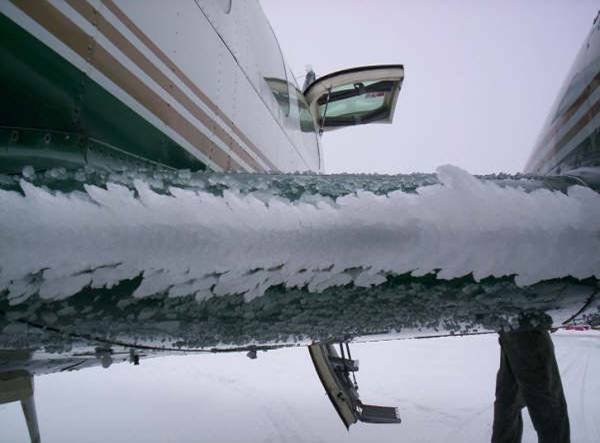 Investigators were also told by other pilots in the area about icing with one pilot saying his wing anti-icing system “couldn’t keep up” with ice accumulation of as much as 4 inches that had developed over the course of just five minutes. The airplane’s encounter with unforecasted severe icing conditions that were characterized by high ice accretion rates and the pilot’s failure to use his command authority to depart the icing conditions in an expeditious manner, which resulted in a loss of airplane control. In other words and if you encounter icing or other potentially dangerous conditions, you need to make a decisive decision and act fast. Was texting to blame for a helicopter crash? The Associated Press is reporting that a medical helicopter ran out of fuel and crashed, killing four people, because the pilot was distracted by text messages. The National Transportation Safety Board (NTSB) is still trying to determine the cause of the August 2011 crash near Mosby, Missouri, but it appears to be the first fatal commercial crash where texting has been implicated. Apparently, the pilot exchanged 20 text messages, mostly with a coworker, over a span of less than two hours before running out of fuel and crashing in a field a mile from the airport. Investigators believe the pilot missed out on several opportunities to see just how low he was on fuel. According to the accident timeline being put together, three of the text messages were sent and five were received while in flight, but none were sent during the final 11 minutes before the crash. Text messages were also exchanged while the helicopter was on the ground, including messages about the helicopter being low on fuel, even though the company which owned the helicopter had a policy of banning the use of electronic devices by pilots during flights. With that in mind, the pilot may have been distracted from his duties – such as performing necessary safety checks and checking the amount of fuel on board before taking off (despite a briefing the aircraft would be low on fuel because it had been used the previous night for a training exercise). During the flight, the pilot radioed that he was lower on fuel than he had initially thought and investigators also think he may have lied about how much fuel he had to cover up previous omissions. In addition, a low fuel warning light could have alerted the pilot, but it was set on “dim” for nighttime use while a pre-flight check (if one had in fact been conducted) should have revealed the light was set in the wrong position. The AP article also noted the October 2010 incident where two Northwest Airlines pilots overflew their destination by 100 miles because they were too busy working on flight schedules on their laptops in the cockpit. General Aviation News will often reprint excerpts from US National Transportation Safety Board (NTSB) accident reports, including one dated June 2011 about a Cirrus SR22 having a wheel brake fire while taxing in Pittsburgh, Pennsylvania. According to the pilot, ATC instructed him to taxi to the runway where he initiated a takeoff checklist. The pilot increased the engine rpm per the checklist, the airplane moved forward slightly and he applied the brakes. The right brake pedal then lost pressure and Cirrus started an un-commanded 180° turn to the left. At that point, the pilot shut the engine and noticed the right wheel was on fire. A subsequent look at data from the aircraft’s multi-function display revealed that while taxiing, engine power had reached 1,100 to 1,900 rpm and the ground speed was 30 mph. According to the aircraft’s Pilot Operating Handbook, the maximum recommended continuous engine power for taxiing is 1,000 rpm. In addition, the Pilot Operating Handbook warned of wheel brake damage or fire if the engine power is exceeded and proper braking procedures are not observed during taxiing. A closer look at the right brake assembly revealed that portions of it were either heavily fire damaged or destroyed while an inspection of the left brake assembly revealed no evidence of a mechanical malfunction. Hence, the pilot’s excessive engine rpm and speed during taxi along with subsequent braking resulting in a wheel brake fire was ruled as a probable cause of the mishap. This a classic, the pilot probably drives his car over 80 mph in a 55mph speed zone, What’s the hurry? basic common sense rule, you really don’t have to be any where.